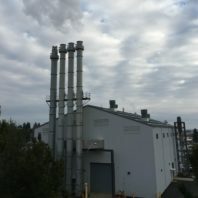 WSU commissioned a new steam plant in 2004 which utilizes natural gas instead of coal as its main fuel source lowering the University’s carbon dioxide equivalent emissions by more than 25,000 metric tons annually. Compared to 1990 emissions, WSU has reduced its criteria pollutant emissions significantly. Annual nitrous oxide emissions have been reduced by 97% (350 metric tons); sulfur dioxide emissions have been reduced by 99.9% (550 metric tons); carbon monoxide emissions have been reduced by 99% (45 metric tons); particulate matter emissions have been reduced by 90% (30 metric tons). Since signing the President’s Climate Commitment in 2007, WSU continues to lower its greenhouse gas and criteria pollutant emissions. We installed additional air pollution controls on our pathological incinerator in 2014. The opacity readings have been reduced by approximately 3 percent indicating a reduction of lead and particulate emissions. Not only did this meet the new regulatory requirements, but also put our emissions well below the established parameters. 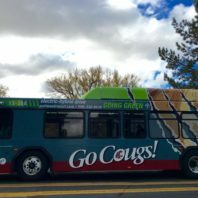 WSU’s campus fleet uses alternative fuel. We have switched to B5, which is diesel containing 5% biofuel for use in the winter. During the summer, we use B10, which is diesel containing 10% biofuel. 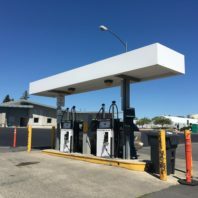 We have evaluated fuel with greater concentrations of biofuel, but currently there is not a feasible outlet regionally that meets WSU’s needs. Also, our climate deters the switch to higher concentrations of biofuel because of the properties of biofuel in colder weather conditions. One of the largest greenhouse gas contributors is refrigeration units. Refrigeration units are often used to provide building air conditioning and operate large refrigerators and freezers. Traditionally, chlorofluorocarbons (CFC) and hydrochlorofluorocarbon (HCFC) were used inside these units. Although new units contain a much more environmental friendly material hydrofluorocarbon (HFC), it is not uncommon for older units to still have the aforementioned more harmful materials. Even though it is not required WSU is voluntarily upgrading the refrigeration equipment when money is made available. Facilities Services continually looks at ways to reduce water and energy use. Since 2011 several projects have been completed that tied individual buildings and systems in the campus wide chiller system. In 2013, the vivarium and equipment in Wegner Hall were tied into the campus wide chiller system reducing annual water use by 250,000 gallons. WSU is always trying to identify and fix illicit discharges. Illicit discharges are the release of anything other than clean stormwater into a storm sewer. Infrastructure at a university which has been in place for over 100 years has many construction projects that require utility connects or rerouting. 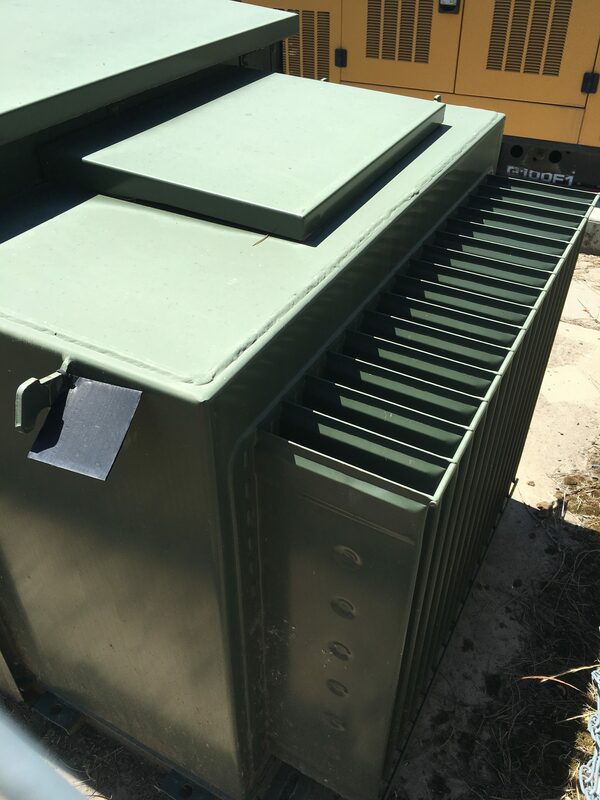 Sometimes sanitary sewer systems can accidentally be connected into the storm system, or processes occurring on impermeable surfaces have changed over time resulting in the contamination of stormwater. Over the last five years Environmental Health and Safety and Facilities Services have identified and fixed illicit discharges at Bustad Hall and Barnard Hall with future projects proposed at McCoy Hall and Engineering Lab Building. Awareness of stormwater contamination has dramatically grown over the last decade. With this awareness, the construction of low impact development at WSU has also increased. 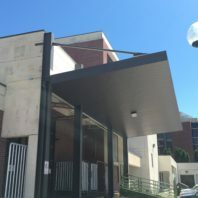 While all new facilities take this into account during the design and construction phase, many projects have taken place on existing facilities. 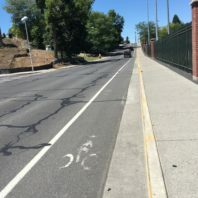 A stormwater detention area was constructed at Mooberry Track, bioswales constructed along Columbia Street parking lots, and permeable concrete installed along Spokane Street were just a couple of the projects completed recently. WSU is continuing to install water meters on buildings throughout campus. Water meters are a way to detect leaks in the system and, once detected, repairs save valuable water from being wasted. 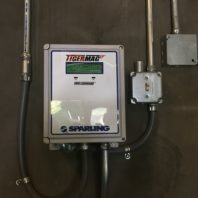 Water meters have also been installed on our irrigation systems for the same reason. In 2015, in Global Scholars Hall, Dining Services opened the Market. 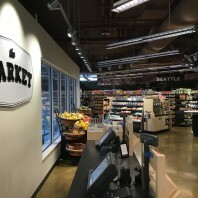 The Market offers a variety of local, natural, and organic items as well as fresh produce, meats, and dairy. It is hoped that the Market inspires healthy eating and provides an opportunity to show how students’ diets can be sustainable. 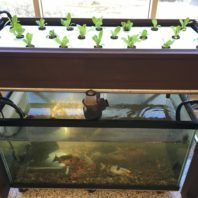 Dining Services designed, constructed, and installed an aquaponics system in Northside Café in 2015. 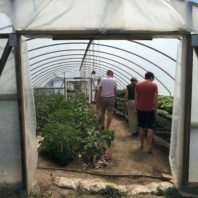 The system was a demonstration project to show how healthy food could be grown in a closed system, conserving natural resources. The food grown in this project was used and sold in the dining center. The aquaponics system was moved to Southside Dining Center and the size and capacity were increased. WSU Dining Services has been very proactive in finding local farmers who can provide food for our dining facilities. Agreements have already been established with Charlie’s Produce, Wilson Banner Ranch, Lamb Weston, Shepherd’s Grain, Omache Farms, Wilcox Farmily Farms, St. Maries Wild Rice, Ameristar Meats, and Snake River Ranch. Dining Services is currently working on agreements with the WSU Organic Farm. This agreement not only provides operating money to sustain the farm, but also healthy food to serve to Dining Services clientele. WSU Waste Management has had a very successful compost program since 1994. 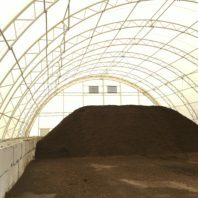 Compost from the facility is sold to departments on campus, SYG Nursery in Pullman, and several other locations in the region. The facility composts about 11,000 tons of material annually which would otherwise be sent to a landfill. The facility was expanded by about 50 percent in 2015. Education is a large component to increasing waste diversion from landfills. Although Facilities Services Waste Management already diverts approximately 74 percent, there is always room for improvement. In 2015, the Common Reading program selected Garbology-a book about America’s trash problem, and with this came the opportunity to not only provide information about waste diversion but also waste minimization. 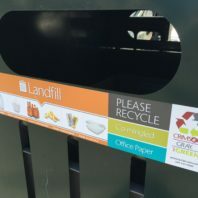 Signs and messaging have been attached to all waste bins around campus providing information about items acceptable in each waste stream as well as emphasizing the need for waste minimization. WSU installed in automatic bailer in 2012. The bailer is used to more effectively package recyclable computer scrap and co-mingled waste streams minimizing the number of shipments to recycling outlets. When recyclable material is shipped without being bailed a majority of the space on the truck is air, causing recycling to not be economically viable. 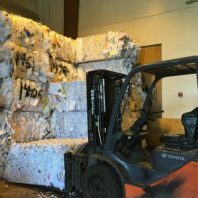 The bailer allows WSU to create enough revenue to offset some of their expenses while diverting material from the landfill and minimizing the unnecessary creation of greenhouse gases during transport. WSU Facilities Services Waste Management is working with McKinstry to identify and install equipment to convert biohazard waste into compostable material. This project would reduce the amount of material being destroyed using the pathological incinerator, lowering WSU’s greenhouse gas emissions and water usage at the same time. WSU Environmental Health and Safety manages the hazardous waste program and is constantly evaluating waste streams to find alternative methods of disposal. Over the last ten years 27,000 gallons of used motor oil has been sent to a refinery to recycle instead of an incinerator. Another waste stream that is being recycled is batteries. WSU recycles over 5,000 pounds of batteries per year. Mercury containing light tubes are also a common product which is recycled. Although WSU has transitioning to LED lighting, that transition is an expensive and time consuming undertaking. 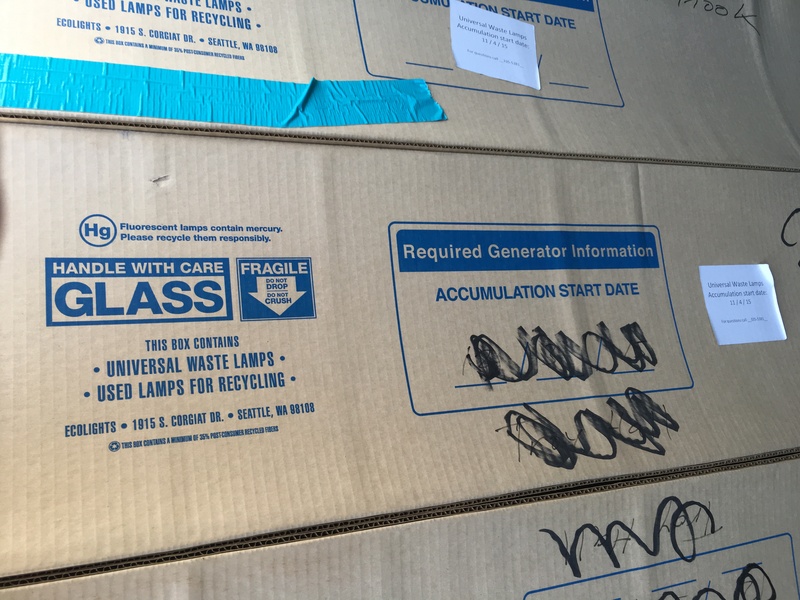 Currently, we have been recycling about 40,000 pounds of light tubes per year. Management of electronic waste has been a popular topic over the last decade due to many companies using landfills in developing countries to illegally dispose of material. WSU has minimized most of this liability by turning an expense into a self-sustaining program. Surplus Stores either resells used computers to the general public after upgrading operating systems or breaking the computers into individual parts and selling the parts to commodity brokers. All other materials such as monitors, printers, and keyboards are shipped to a recycling company approved by the State of Washington. On average WSU recycles approximately 120,000 pounds of electronic waste annually. WSU proactively retrofitted electrical equipment throughout the Pullman campus from 2002-2005 replacing PCB contaminated dielectric fluid with an environmental friendly fluid. Similarly, during lighting retrofit projects PCB contaminated ballasts were replaced with electronic ballasts. In total, WSU has removed 270,000 pounds of PCB from our facilities for more energy efficient and less toxic equipment. WSU Environmental Health and Safety restarted the mercury exchange program. Elemental mercury is a toxic material which can cause many environmental and health problems when released into the environment. Technological advances have created an alternative product-alcohol containing thermometers-which are adequate for most applications. Upon request, EH&S for free will exchange an alcohol for a mercury thermometer. 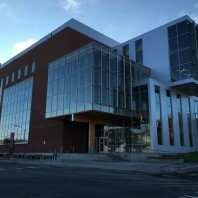 The Paccar Environmental Technology Building (PETB) was constructed using renewable materials and technologies developed at WSU, including wood composites, recycled concrete, and pervious pavement. 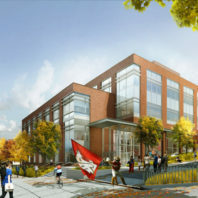 The PETB will also incorporate water capture and reuse, heat recovery, individual control of air quality factors, maximized day lighting, optimal siting and incorporation into its landscape, along with numerous other features that will make it the “greenest” building built to date on the WSU Pullman campus. The Brelsford Community Center received a LEED Silver certification. In order to achieve this certification several creative design and construction strategies were used. 87 percent of the roof is covered with a high solar reflectance which mitigates the heat island effect. 93 percent of the construction waste was diverted from the landfill. More than 50 percent of all the wood used was certified by the Forest Stewardship Council, verifying environmentally and socially responsible forest management practices were used on this material. 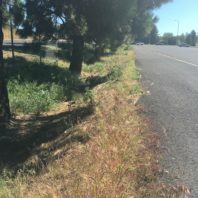 Native and climate tolerant plants were used in the landscaping to minimize the need to irrigate. Low flow fixtures were used lowering water usage by an estimated 50 percent over similar sized facilities. Northside Residence Hall was completed in 2013, and received a LEED silver certification. Housing and Dining Services, when updating student housing, took into account the need to be sustainable so they integrated many concepts into this facility. 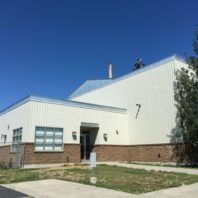 Energy is always a concern and several energy saving designs were used such as natural daylight available in all rooms, reflective windows to minimize radiant heat, and the walls and ceiling were built with high insulation values. Low flow water fixtures were used to conserve water. Transportation for students can be difficult, and this was addressed by having nearby bus access, two Zipcars, and Green Bike stations. 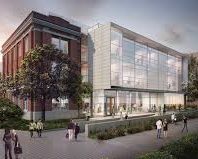 The Elson Floyd Multicultural Center is currently be constructed with a completion date of 2017. The facility is being designed and constructed to LEED silver certification. 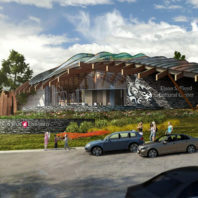 At the center of this facility is a living room connected to four knowledge rooms devoted to educating people about the state’s four largest underrepresented populations-African Americans, Asian Pacific Americans, Chicanos/Latinos, and Native Americans. Troy Hall is a newly remodeled interdisciplinary sciences facility. The building has been renovated to achieve LEED Silver Certification. To learn more about the LEED points earned in the Troy Hall renovation, read this educational brochure! The Digital Classroom Building is currently under construction and scheduled to open in the fall of 2017. It was designed and being constructed to LEED Silver standards. The building embodies a space where technology will be used to enhance learning for current and future students. 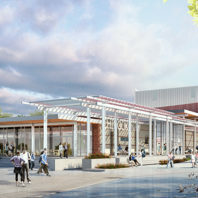 The Chinook Student Center was the name selected for the Bookie Building with renovations to be completed in 2017 and constructed to LEED silver standards. The facility has many amenities for students including exercise equipment, study spaces, meditation rooms, and many other opportunities for students to get involved. University Recreation promotes healthy lifestyles and one of these avenues is through exercise. They have established a Green Bike program which currently has 140 bikes with stations conveniently placed throughout campus. This is an opportunity for students to get exercise and get to locations around campus quickly while also minimizing carbon emissions through a greener means of travel. Transportation Services and the City of Pullman work together to provide convenient and reliable transportation through the bus system. The bus system is used over 1.4 million times annually by students, faculty, and staff eliminating the use of commuter vehicles and unnecessary traffic and parking congestion. 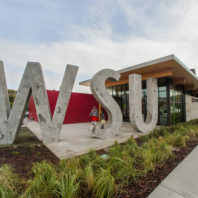 With the continual growth at WSU, they are working with the city to find ways to meet the needs of the students through route changes, expanded hours, more buses, and shorter wait times. WSU identified the need to provide a service for students having minimal long distance transportation options. They have provided two affordable options: WSU worked with Wheatland Express and now buses to Seattle every weekend. Also, they offer routes to Tri-Cities, Vancouver, Portland, and Tacoma on holidays and breaks. Transportation Services has also found alternatives in Pullman for those needing to shop or drive shorter distances. 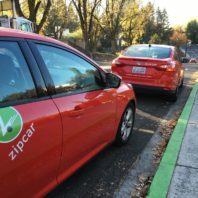 We currently have a fleet of Zip Cars strategically placed throughout campus. 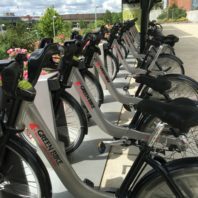 In coordination with the WSU Master Plan, Transportation Services is developing and hoping to implement a Comprehensive Transportation Plan which incorporates a Bike and Pedestrian Plan. The goal is to evaluate the traffic and parking demands to develop a plan to accommodate these needs during WSU’s continued growth. 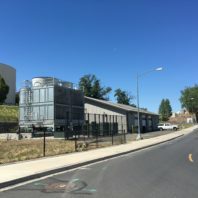 Facilities Services installed a waterside economizer at the central cooling plant in 2015. Not only did this reduce water usage, but reduced annual energy use by 513,256 kWh. Facilities Services continually has looked ways to reduce water and energy use. Since 2011 several projects have been completed that tied individual buildings and systems in the campus wide chiller system. In 2013, the vivarium and equipment in Wegner Hall will tied into the campus wide chiller system saving 47,000 kWh annually. The Information Technology Building was added to the system in 2011 saving 927,000 kWh annually. The distribution of air in laboratory buildings because of air temperature parameters is one of the most energy consuming functions of a building. A new air handling system was installed in Sloan Hall in 2012. This new air handler reduced annual energy use by 331,600 kWh and annual steam use by 2,217 k-lbs. WSU had worked with Battelle and Avista to implement are smart grid as part of Pacific Northwest Smart Grid Demonstration Project. 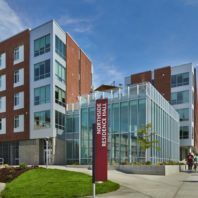 This project, which started in 2009 was implemented in 2014, and while WSU is still working to improve the systems we have made great strides in energy savings. By implementing the heating ventilation air conditions (HVAC) load sheds and integral volt-var control measures we reduced annual energy use by 1.4 million kWh. Student Recreation Center, although a fairly new facility, found several ways to save energy in 2011. They installed energy efficient washers and dryers and upgraded lighting, HVAC, and the swimming pool and spa heaters. These changes saw an annual energy reduction of 312,000 kWh. 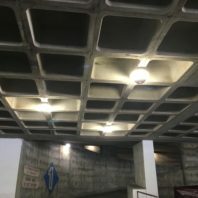 Facilities Services is currently working with McKinstry on a lighting retrofit project at the parking garages, installing LED lighting, and at growth chambers on campus. This project is estimated to reduce annual energy use by 1.16 million kWh. Housing is currently installing LED lighting into several dormitories, replacing less efficient compact fluorescent lighting. The saving is unknown, but through grants and rebates this project is projected to pay for itself. WSU Purchasing has worked with local vendors to integrate the sale of remanufactured ink and toner cartridges into their contracts. This work in 2010 and 2011 significantly increased the sale of remanufactured cartridges to approximately 20 percent of the total units purchased. In 2012, further promotion of the program led to a 28 percent increase in sales. The program continues to be pushed with equipment purchases being made based on the ability to use remanufactured cartridges. In an effort to bring awareness and opportunity to WSU student, faculty, and staff and Sustainability Fair is hosted by Environmental Health and Safety biannually. This is an opportunity for green vendors and contractors to promote their services and products to the WSU community. WSU Facilities Services and Housing and Dining Services have spent the last decade transitioning to effective green cleaning and maintenance products. Not only are these products safer for the employees, but are much healthier to the environment.